A strong and focused Digital Strategy is key to achieving measurable results on-line. The most important aspect is to apply the foundations of traditional marketing and creative branding to Digital Strategy. This includes developing a strong Value Proposition, creating compelling Calls to Action and crafting a unique on-line brand identity. 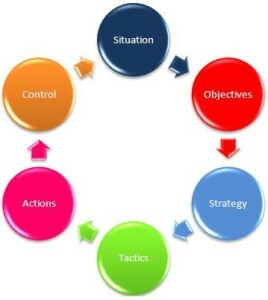 Situational Analysis – understanding your brand and its competitive environment. Objective Setting – what do you want to achieve ? Strategy formulation – how are we going to use branding and digital marketing to achieve the objectives. Control – measure results, tweek strategy and contine. I have recently completed a comprehensive Digital Strategy for an Irish distribution company www.spehenmillerltd.com that included a web re-build, SEO, Social Media integration with new Hosting from www.blacknight.com.